Between 1934 and 1939 Birmingham Corporation Transport, which adopted the name Birmingham City Transport from 1937, took some 800 examples of the Daimler COG5 model, which, despite its modest five cylinder Gardner power unit, was a sophisticated performer with an effective flexible engine mounting and a fluid flywheel/epicyclic gearbox transmission. Most of these buses were bodied by Metro-Cammell, though many were fitted with Birmingham Railway Carriage & Wagon (BRCW) bodywork, all to the distinctive Birmingham H30/24R design. Many of these reliable buses survived up to 1954/55, with a solitary example, No.1235 of 1939, being withdrawn in 1960. 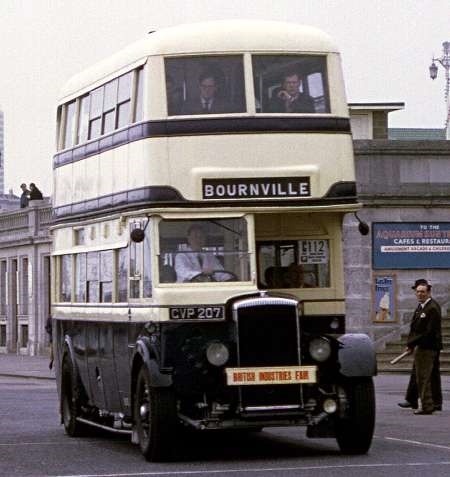 CVP 207, No.1107, was one of the 1937 batch, but in 1950 it received the Metro-Cammell body from similar bus No.1216 of 1939 vintage, which was then withdrawn. In 1954 1107 became a snowplough, but returned to passenger service in 1957 when the Corporation took over some Midland Red routes. On being finally retired in 1959 it thankfully escaped the scrapper’s torch, and now resides with the Transport Museum at Wythall. 1107 is seen above at Brighton during the 1969 HCVC Rally. There were still a couple of these pre-war COG5s tucked away in the back of Moseley Road Depot when I moved to Birmingham in September 1961. Doubtless a few others elsewhere on the system.